The role that Israel is playing in arming Brazil's World Cup securities has activists up in arms, and raises disturbing questions about the future of our cities. When I was in Brazil for those first days of the World Cup, I was—with many other journalists—tear gassed by military police. I saw sleek, urban-outfitted tanks in the streets and I felt concussion grenades send subsonic shrapnel crashing into my eardrums. I didn’t see the drones flying overhead, but then again, no one without a Hubble telescope is supposed to see the drones. The level of high-tech hardware on display is hardly different from what we have seen at previous World Cups and Olympic games. Gunships and missile launchers have over the last dozen years become as much a part of the scenery as the FIFA Fan Park and Olympic Village. The problem, though, is not really how the media has yawned past these kinds of post 9/11 security imperatives (although this is a problem). It’s the way that in too many host countries the militarization does not go away when the mega-events end. Instead, it becomes the new reality. If you buy a drone you are not, as a security official in London told me in 2012, “going to just put it back in the box.” Surveillance culture becomes normalized, and through the Trojan horse of sports, a fresh Orwellian reality is born. Concern about protesters, crime and terrorism have all undoubtedly played a role in the security buildup, but Brazil has also built up its armed forces dramatically in recent years as a way to show the world that its new global economic might would be matched militarily. Yet the presence of such overpowering—not to mention high tech—weaponry raises a critical question: Who is arming Brazil? Who supplies—and profits—from their new normal? This flow of arms from Israel to Brazil has sparked a movement in Brazil led by the Frente em Defesa do Povo Palestino–SP (Front in Defense of the Palestinian People–São Paulo), which is composed of dozens of Brazil’s civil society organizations and unions, and is a part of the Boycott, Divestment and Sanctions movement. 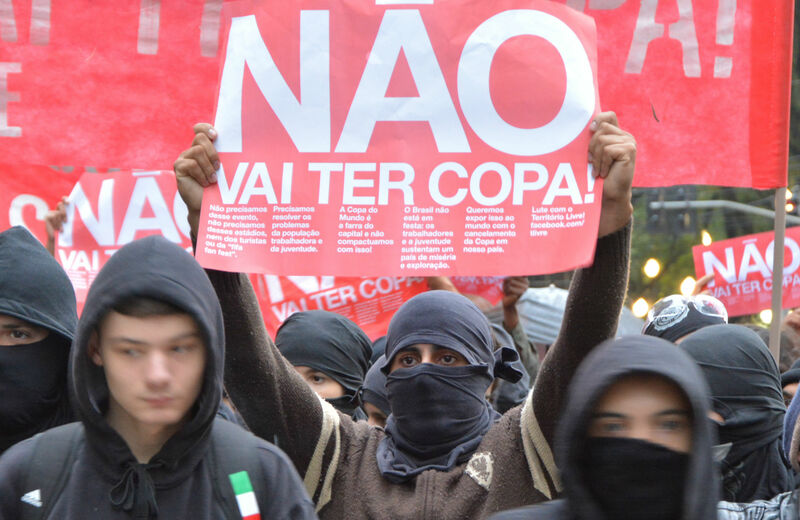 Last year they protested at the Latin American Aerospace and Defense fair in Rio attended by arms manufacturers from around the world all competing—with the help of scantily clad models—to arm Brazil for the World Cup and the Olympics. The event was seen as a triumph for the thirty Israeli arms manufacturers who were, according to an insider,given special access to Brazilian Vice President Michel Temer and Secretary of Defense Celso Amorim. “What Rafael, Elbit and Global Shield are doing is exporting the very tactics used on the Gaza Strip,” said one activist to me in Rio. “They are taking neighborhoods of poverty and anger and creating Gaza in the favelas of Brazil. The goal of anyone who sees themselves as a part of civil society should not be more Gazas.” From even the most basic humanitarian perspective, this is unassailable, particularly given the events of this week, as collective punishment, bombings and demolitions, have been the state response to the discovery of three dead Israeli teenagers in the West Bank. We should be figuring out how to demilitarize Gaza so the 1.8 million people who call that strip of land home have freedom of movement and opportunity without the constant specter of military incursion. Exporting the “Gaza security model” to the cities of the future is a recipe for dystopia. Using the World Cup—and our collective love of soccer—to create that new normal is both frightening and enraging. This sport, created and nurtured by the poor across the world, is now being played in exclusion zones under the watchful eyes of drones in the skies and boots on the ground. We may be rejoicing in the beautiful game right now, but we also need to fight to reclaim it.